Leading up to the 2019 NFL draft, which starts April 25, Yahoo Sports will count down our top 100 overall prospects. We’ll count them down 10 at a time, followed by profiles on our top 30 overall players. Key stat: Taylor earned the third-highest run-blocking grade among starting Power-5 tackles in 2018, according to Pro Football Focus. The skinny: Taylor was listed as only a three-star recruit, but he had a healthy number of suitors – including many major programs – coming out of the Cocoa Beach area in Florida. 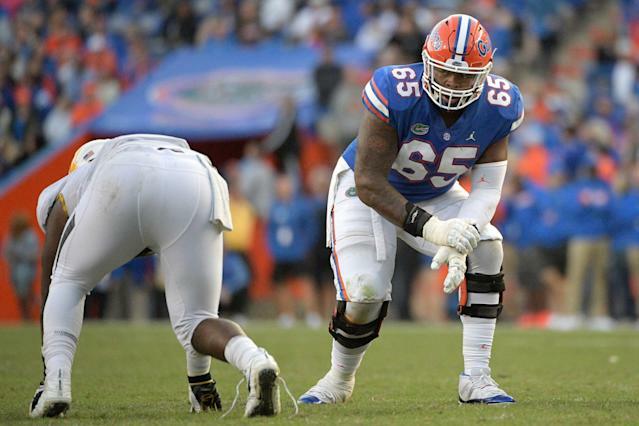 He committed to the Gators eventually and started 12 of his 13 games played at right tackle as a freshman, the only first-year player to crack UF’s offensive line rotation in 2016. Taylor was named to the All-SEC Freshman team and earned many freshman all-America mentions. In 2017, Taylor started 11 games – nine at right tackle, followed by the final two at left tackle – while playing through a meniscus tear. Last season as a junior, he played all 13 games at right tackle but did not start the opener against Charleston Southern because his conduct failed to “meet the Gator standard.” Taylor was not named to either the first- or second-team all-SEC team (the conference names one center and four other offensive linemen to each squad). Taylor, who turns 22 in November, declared early for the 2019 NFL draft. He was diagnosed with a mild distal hamstring strain and was held out of all athletic testing events at the NFL scouting combine except for the bench press. Taylor opted not to perform any of the testing at his pro day, only performing positional drills there. Upside: Massive, hulking right tackle with a mean streak. Big, heavy hands – if Taylor gets his paws on you, it’s over. Harnesses his good core power in the run game and will move people against their will. Great length and reach (85-inch wingspan) to wall off defenders with ease at times. Seeks to bully people and can unleash the nasty. Can be the anchor of a right-handed run game – turns out edge setters wide and can crash hard inside on down blocks to create nice lanes in the power series. Nice finishing skills on full display most games. His game is not just about brutishness. Has some savvy and skill that’s clear in his pass sets and his controlled movement in the run game. Nice foot quickness. Has clear upside as a pass protector and could be very good in this area with technique development. Stays inside out on rushers and held his water on slower-developing pass plays (the Gators had a lot of these with some athletic and sometimes indecisive passers behind him). Stands up to bull rushes well. Decent bend and nice balance on contact – doesn’t overextend for a big, power player and will play through his man. Choppy, quick feet – not a lumberer at all and can look rather smooth in his movements. Stood tall against line stunts and overload blitzes. Side step and kick slide are what you want to see. Will stick and move and usually gets to where he wants to go. Good climber with the potential to be better. Will keep rushes guessing with his drops and take them out of their comfort zones – plays with a defensive mentality. Effort typically is very strong, playing through the whistle. Tough – played through a meniscus tear as a sophomore. Projects as a starting right tackle, but could play the left side if needed and also has the chops to make a quality guard – four-position potential. Had great outings against Kentucky’s Josh Allen and Mississippi State’s Montez Sweat, two potential top-10 picks. Dominated more often than not in 2018 after flashing earlier in his career – seems to be close to putting it all together. Coaches say he’s willing to put in the time in the film room. Figures to be an early starter who is physically ready for the challenge from Day 1. Downside: Can be more of a finesse player in the run game than you’d expect – a little too much get-in-the-way blocking. Still can strain to move bigger defenders at times. Strength development is on the right track, but he might need even more work to better harness his natural power. Not yet a true road grader (but has the potential to become that). Lets rushers get into his body and can’t always redirect hands quickly enough. Gets his hands too wide, and technique will need refinement. Counters can give him trouble – will cave against power moves inside and get half-manned too easily at times. Overplays the edge and leaves himself exposed inside. Can also get long-armed and pushed back into the backfield. Most of his struggles come against speed rushers on the edge, which is why some teams view him as a guard not a tackle. Can get stressed by elite speed and quick get-offs. Will overset and widen his hands to reach. Feet can get a bit stuck at the top of the rush. Weight has ballooned in the past and must closely be monitored, and he played closer to 330 pounds than the 312 he weighed at the combine. Character must be fully vetted following early season suspension. Best-suited destination: You want to make him a guard? We can get behind it. But Taylor’s upside as a tackle is strong enough to start him there. Most teams we spoke to would do the same, and there appears to be strong appeal for him as a prospect without too many concerns about his technique development. Among the clubs that could have significant interest in Taylor include the Jacksonville Jaguars, Cincinnati Bengals, New York Giants, Tampa Bay Buccaneers, Green Bay Packers, Buffalo Bills, Detroit Lions, New York Jets, Atlanta Falcons, Carolina Panthers, Tennessee Titans and Houston Texans. Fact: As a junior in high school, Taylor was approaching 400 pounds. His dream school was Florida, but the Gators coaching staff said it would not offer him a scholarship until he dropped a lot of weight. That’s when Taylor got more serious about his conditioning. Taylor weighed 347 pounds when he signed his letter of intent with the Gators and showed up at the combine at 312 – the lightest he said he’s weighed in years.